Willie McCovey is considered one of the greatest left-handed hitters in baseball history and a Giants legend. His long playing career translates to a lot of baseball cards, so this list of the top Willie McCovey cards will help collectors zero in on some of the most important options for the Hall of Fame first baseman. 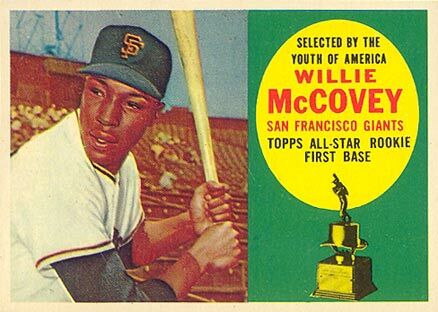 Beginning with his appearances in 1960 Topps, which still featured horizontally-framed cards, to his last regular base card found in 1981 Fleer, McCovey outlasted the Topps monopoly on trading cards. A longtime teammate of Willie Mays, McCovey is second only to Mays in terms of card value and collectibility of all the San Francisco Giants players. That is why batters are hitting home runs at AT&T Stadium into "McCovey Cove" on the San Francisco Bay. 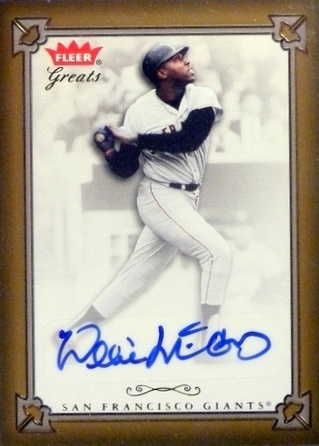 The following list features some of the key Willie McCovey baseball cards available to collectors. It is by no means meant to highlight only his most expensive cards, but rather showcase a notable assortment of choices from throughout his cardboard career. A "dutch angle" refers to a camera shot in which the focus is set at an angle to the side of the frame. You typically see it in films to show that something is not quite right or in just about every episode of the 1966 Batman TV Series. 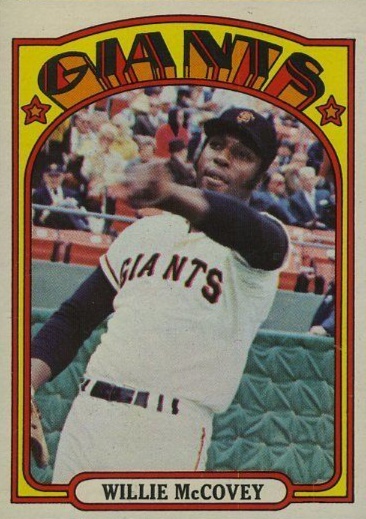 It is something rarely used in baseball cards and McCovey's 1972 Topps card is one of those rare exceptions. All of the incarnations of Fleer's Greats of the Game series give collectors a chance to get certified autographs for many retired stars. McCovey's cards in the 2004 set use sticker autographs so collectors may be able to find these at lower prices than on-card autographs in other sets. Some designs just work perfectly with a given team's jersey colors and design. The famous wood design used in 1962 Topps blends well with the orange in the San Francisco Giants logo and jersey, creating a great-looking card. Along with a nice design, this card was short printed, making it one of the most valuable cards in this set's final series. 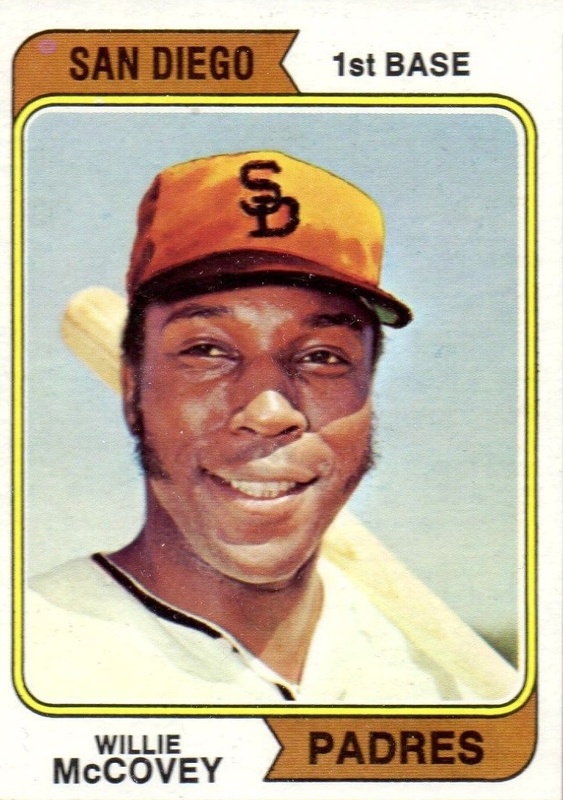 In the 1974 set, McCovey was the subject of one of the most memorable Topps errors ever. Rumors were flying that the San Diego Padres were going to be moving to Washington, D.C. to replace the Senators, who had moved to Texas the previous season t0 become the Rangers. Topps was so confident that this was going to happen that they included cards in 1974 that listed Washington as the location and "Nat'l Lea." for the team name, which had yet to be decided. The error was eventually fixed and the Padres are still in San Diego today. 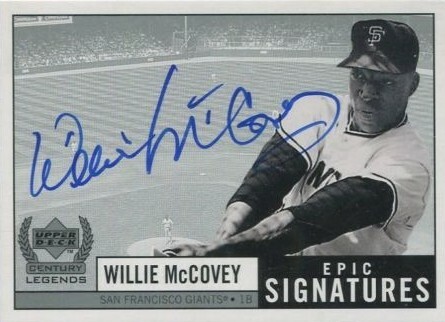 Overall, McCovey was a fairly frequent signer in contemporary sets that include veteran players. Although he is in a large number of high-end sets, his autographs are typically short printed, creating a varied market for his autographs that range from into the hundreds. 1999 Upper Deck Century features one of the first certified McCovey autographs and the card design gives a lot of space for his signature, which is a huge plus. 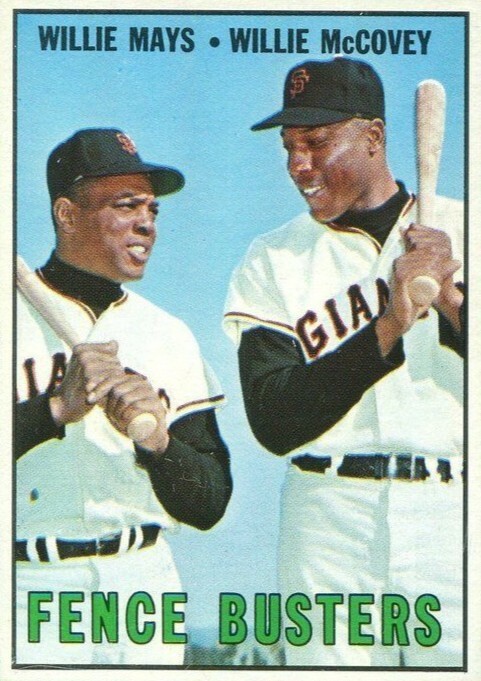 The two Willies, Mays and McCovey, dominated the middle of the Giants lineup for 13 seasons from 1959 to 1972. They also share a few trading cards, including this "Fence Busters" combo card from 1967 Topps. Combining for 814 home runs as teammates, they were truly the first "Bash Brothers" from the Bay Area, long before Mark McGwire and Jose Canseco. The previous card gave us two superstars in the same lineup, so let's got back a few more seasons and take a look at the star power included on this Home Run Leaders card from 1964 Topps. We have McCovey and Mays again, but this time we have a third Hall of Fame member in Orlando Cepeda, who also played for the Giants. Throw in Hank Aaron, the future home run king, and you get a lot of bang for your buck. 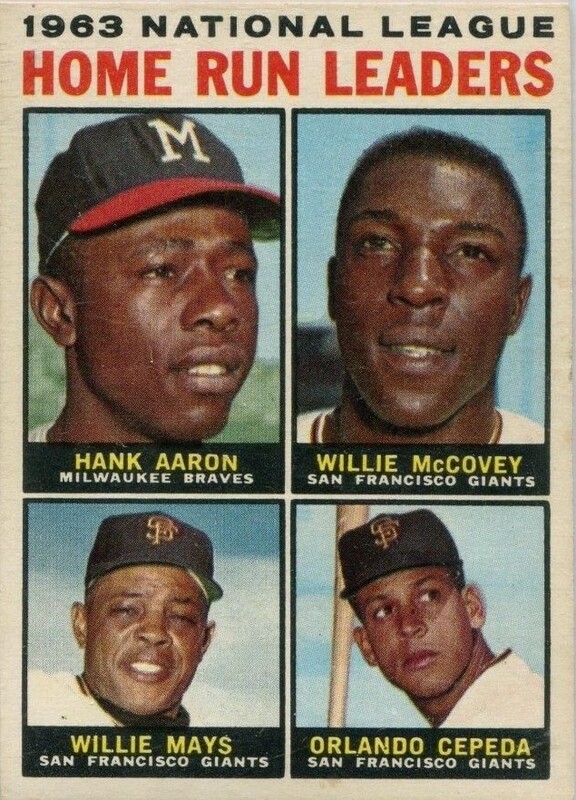 It is rare that a superstar has two rookie-year cards in the same set, but that is the case for McCovey in 1960 Topps. In addition to his All-Star Rookie card (more on that in a moment), there is also a card honoring his selection to the 1960 All-Star game by Sport Magazine. 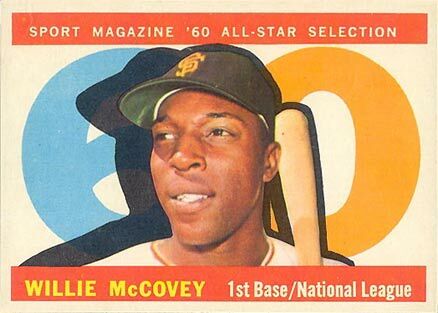 The All-Star Selection cards were included in the last series of the set and McCovey's has a value of roughly a third of his primary rookie card. 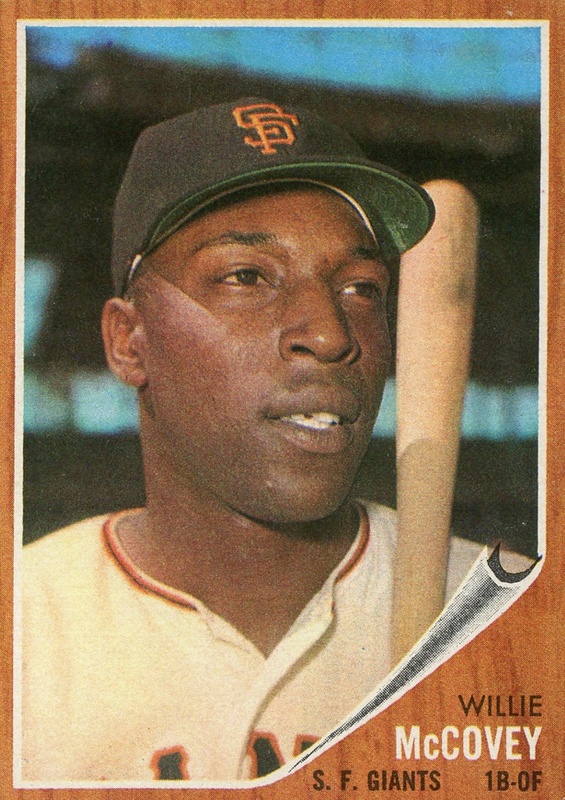 With his elbow on his knee and the other arm resting on the bat barrel, McCovey's 1961 Topps card features one of the most iconic poses used by home run sluggers. It was so nice that Topps used the identical photo for his 1963 card, as well. 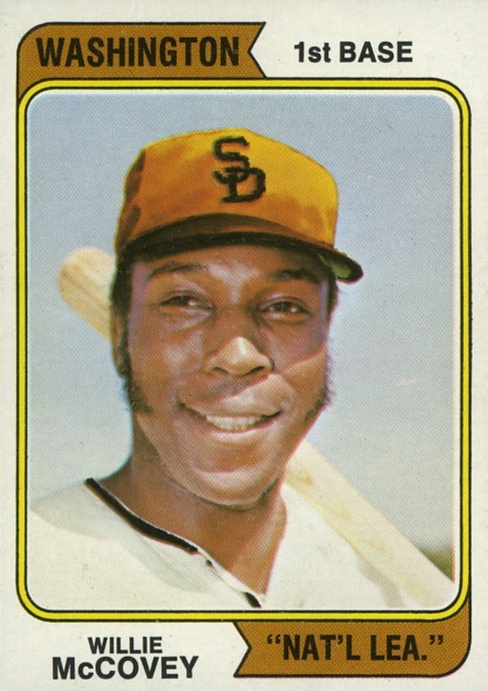 McCovey again took a knee in the same pose for 1970 Topps, but they used a different photo. 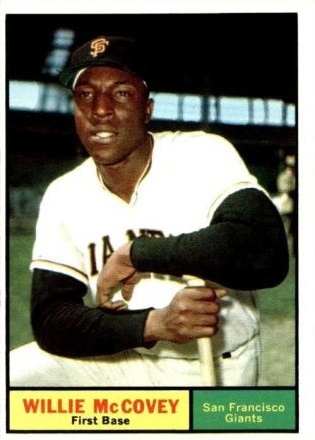 McCovey was able to win the 1959 Rookie of the Year crown while only playing in 52 games. His first season in the majors included a debut game that ranks among the greatest of all-time. He went 4-for-4, hitting two triples and two singles against the Phillies' Hall of Fame pitcher Robin Roberts. His rookie card from 1960 Topps is one of the most popular cards in the set, with high grades selling well into the thousands. It also appears on our list of the Top Baseball Rookies Cards of the 1960s. I have a baseball carad that turned up in a box of other unrelated items. IT is Willie Lee McCovey w/bat over shoulder “first base”. Does it have any value?